Important to note is that Hammoura only played drums on one song for these sessions, namely ‘To Dream Of Ur’. Having severely damaged his arm during the North American tour in support of the preceding album, Derek Roddy was called upon to perform the studio sessions. Tony Laureano would step in for domestic and international roadwork. Anybody with a keen ear will hear the slight difference in production on the Hammoura cut and the remainder of songs for which Roddy laid down the drums. The songs were written with Hammoura’s style in mind, and one can’t help but notice Roddy’s influence over these tracks with his precise and tight delivery. This second album is denser, busier and more demanding than the debut album. It also is more atmospheric and complex. 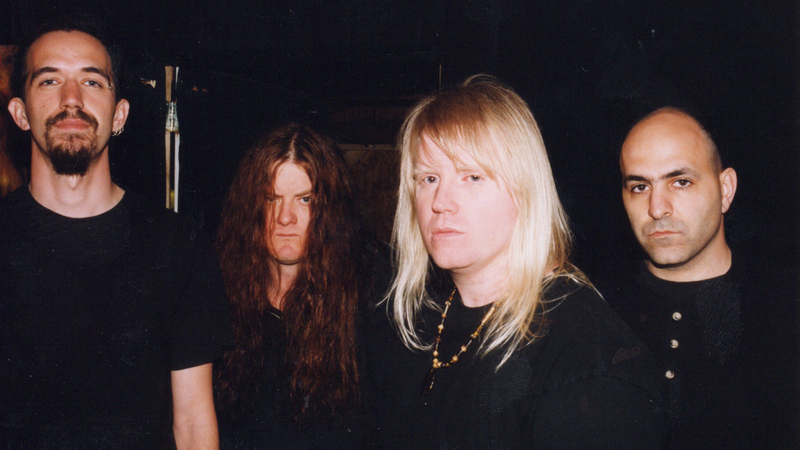 Nile might have been at the forefront of innovation in terms of merging death metal with Egyptian segues, instrumentation and highly atmospheric interludes – their approach to death metal wasn’t exactly novel or brimming with original ideas. Far from it. The album picks up where “Amongst the Catacombs Of Nephren-Ka” left off, and piles more speed and technical playing upon it. Still Nile is merely retreading old, well-trodden grounds. Incantation, Monstrosity and Vader are most recognizable among the influences and techniques used, and the three-way vocal interaction excepted – this is album is hardly as innovating as many people make it out to be. I’ll concede that the high speed and level of technical skill to play this sort of material is awe-inspiring, demanding and requires a level of discipline and commitment that few will have, or can muster. That doesn’t change the fact that Nile wasn’t really doing anything of interest with the genre. This is meat-and-patatoes death metal played at ridiculous speeds and with three equally impressive vocalists. Thankfully, the songwriting saves the mediocrity of the style. The title track is a trademark example of the band’s style. 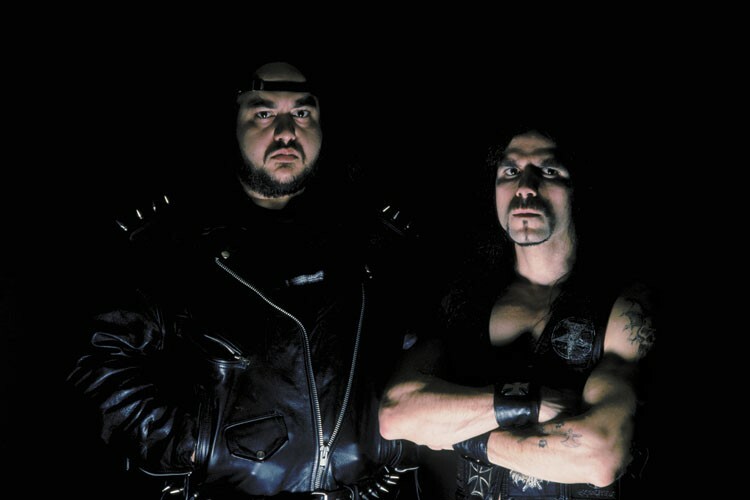 Combining the riffing of Incantation, with “In Dark Purity” era Monstrosity formatted song structure and a “De Profundis” era Vader level of energy and delivery, the band is able to wear its influences on its sleeves without being accused of outright stealing their decimating riffs, chord progressions, or overall presentation. The Egyptian segue during the chorus is highly satisfactory and the sparingness of its use only serves to magnify the atmospheric effect. Another thing that Nile always understood is the importance of leads/solos, and a track as ‘Defiling the Gates Of Ishtar’ proves that in spades. The leads and soloing push the song to its climax, and proves that Nile doesn’t need its most recognizable gimmick to be thoroughly effective. The use of choirs and additional instrumentation adds to the flavor, but people come to the band for high-speed death metal first, all the rest distant second. ‘The Black Flame’ is interesting for the sake of its ethnic chanted intro, and its ominous slow building opening passage that channeled Morbid Angel better than the real thing at the time of this record’s original release. This is followed by an instrumental track before giving way to the second signature track of this album, ‘Masturbating the War God’. Nile hadn’t changed all that much in the two years since the debut, because this track is a retread of the “Amongst the Catacombs…” style, just a bit faster, more evenly structured and with a better sense of pacing and melody. ‘Multitude Of Foes’, the writing debut for Toler-Wade, is a high mark for the record and his more technical, bouncing and busy writing style plays to the strengths of all involved. The song forms the basis for the next record, and Nile’s gradual change into a more technical, percussive and speed-oriented outfit. ‘Chapter For Transforming Into A Snake’ follows largely the same technique, but is more in the style of the preceding record. It is redeemed by grace of its absolutely stellar lead/solo. ‘To Dream Of Ur’, the only track to feature Pete Hammoura, has a different snare – and kickdrum sound (fuller, warmer) and displays what could have been had he not been injured, and thus forced to bow out the unit he co-founded. 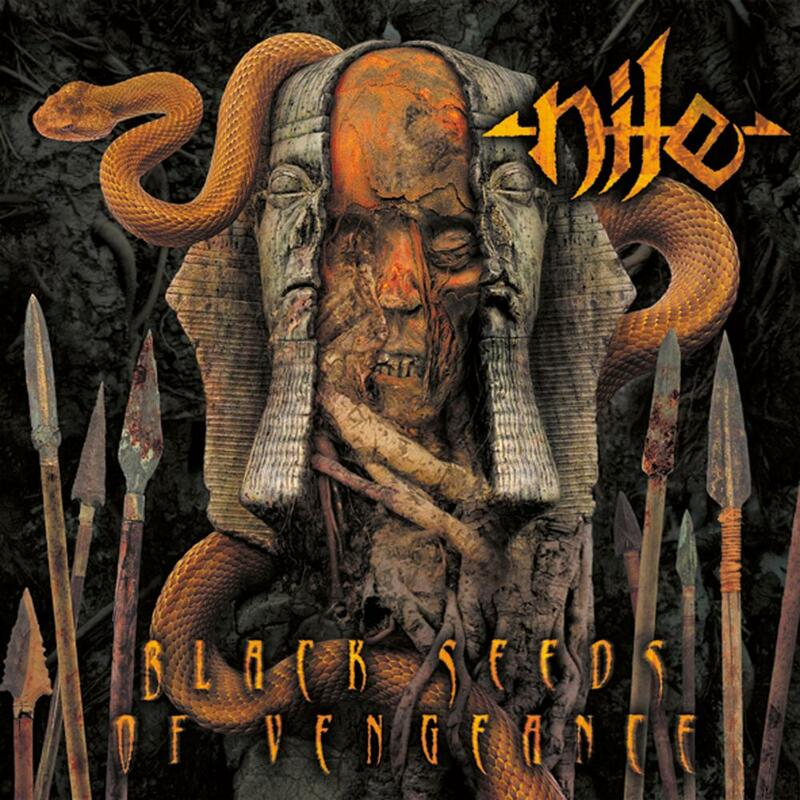 For the first time artist Wes Benscoter was allowed to craft the cover artwork, and combined with the graphics and imagery provided by Adam Peterson “Black Seeds Of Vengeance” was the best looking Nile product up to that point. The recording at Sound Lab in South Carolina with producer Bob Moore results in a more balanced production job with additional levels of clarity and definition. The instrumental segues and ethnic instrumentation sound more roomy and far better realized this time around. On all fronts there has been significant progress made by all involved in this production. Nile had proved its worth with a second album this ambitious and wide in scope. It wouldn’t be until the next album that the band would be able to pull off this style convincingly and confidently. As a stepping-stone to greater things and better, more involved songwriting this record is the logical and connecting link of the band's early evolution out of their primitive roots. Despite the overall banality of the death metal aspect of this record, it is worthy of interest and purchase – and recommended to those who adore Nile’s earlier, more primitive take on their genre of choice. In a lot of ways “Chainsaw Dismemberment” is the ultimate Mortician album. It is the culmination of the “Hacked Up For Barbecue” sound. For the duration of one sole album Mortician embraced its (however few) strengths and excised its weaknesses. With all subtleties now safely abandoned in favor of being the fastest, most downtuned and, arguably, the most brutal band on the planet Mortician fired off another 28 rounds of horror-inspired downtuned cavernous death metal. That these tracks are more memorable because of its usage of excellent stock movie samples than the actual music they introduce, is an age-old problem that sadly wasn’t rectified with this release. Fortunately, a lot of kinks of previous releases have been noted and corrected, and “Chainsaw Dismemberment” is the last album besides “Hacked Up For Barbecue” worth hearing. Stylistically there isn’t much of a departure between this and the preceding record, except that the drum programming is more tastefully incorporated. Once again that is a very relative statement as this is Mortician we’re talking about. The muddy guitar tone is completely blown out and overly distorted, making it closer in comparison to the preceding “Zombie Apocalypse” EP. The bass guitar is distorted even more than before, but still somehow manages to make its lines identifiable, which is a first. Will Rahmer’s vocals are pretty much identical to the foregoing record. There has been no progress made as far as riffing, on either rhythm – or bass guitar, is concerned. These still are rough approximations of stripped down early Incantation riffs with maximum distortion. The key difference is that they are now tuned even lower than before. The subwoofer vocals and heavily distorted bass guitar still are hard to tell apart at times, but at least an effort was raised to make the bass guitar sound like an actual instrument. “Chainsaw Dismemberment” is the second Mortician album, and the first to feature entirely new material. It is the second of a very loosely conceptual number of albums dealing with the “The Texas Chain Saw Massacre” series of horror films from the ‘70s and ‘80s. The concept is really no more than the cover artwork, the album title and a few songs and samples used. There is no need to pay attention or stay awake because this is Mortician. Never a sophisticated band, or even a remotely intelligent one – nothing is ever really made of the concept, or the idea of that concept. They could have inverted expectations by writing lyrics from the perpetrator’s point of view instead of the victims’. It could have been lyrics detailing the declining mental mindset of a deranged psychopath. No. Instead you get exactly what you think you will. Short sentences that outline the plot basics from whatever flick they happen to be sampling. The lyrics still read like a horror movie synopsis written by a six-grader with a limited grasp on the English language, and the band’s crude delivery doesn’t help matters either. As with the preceding album it is far more rewarding to figure out which movies are sampled. The choices are, once again, among the better ones in the genre. With this album you’ll get samples from “When A Stranger Calls” (1979), “Henry: Portrait Of A Serial Killer”, “Silent Night Bloody Night”, “Wolfen”, “I Drink Your Blood”, “Zombi 2”, “The Crazies” (1973), “Friday The 13th Part II”, “Slaughterhouse”, “Inferno” and “Phantasm II”. If there’s one thing to say about Mortician, and its core duo, it is that they have an excellent taste in cult - and bad cinema. I’d rather spent a night talking to these men about their taste in cult cinema than about the actual music they put out. The band’s insistence on not changing anything, ever – is both admirable and stupefying. Granted, Mortician did found a niche in the death metal genre and cornered it with all the gusto and enthusiasm you could possibly ask for. In that respect they are pretty much similar to its Tampa, Florida contemporaries in the also horror-obsessed Six Feet Under. It is safe to assume that both bands’ fanbases overlap at certain points because both bands to thrive on barbaric simplicity and a recognizable gimmick to propel the limited musical package along. Where Six Feet Under has its charismatic frontman and rock ‘n roll drive, Mortician is the band for easily impressionable folks who seek the heaviest, most downtuned and ‘brutal’ band on the scene. There are 28 songs on this record, and they are mostly interchangeable at best. 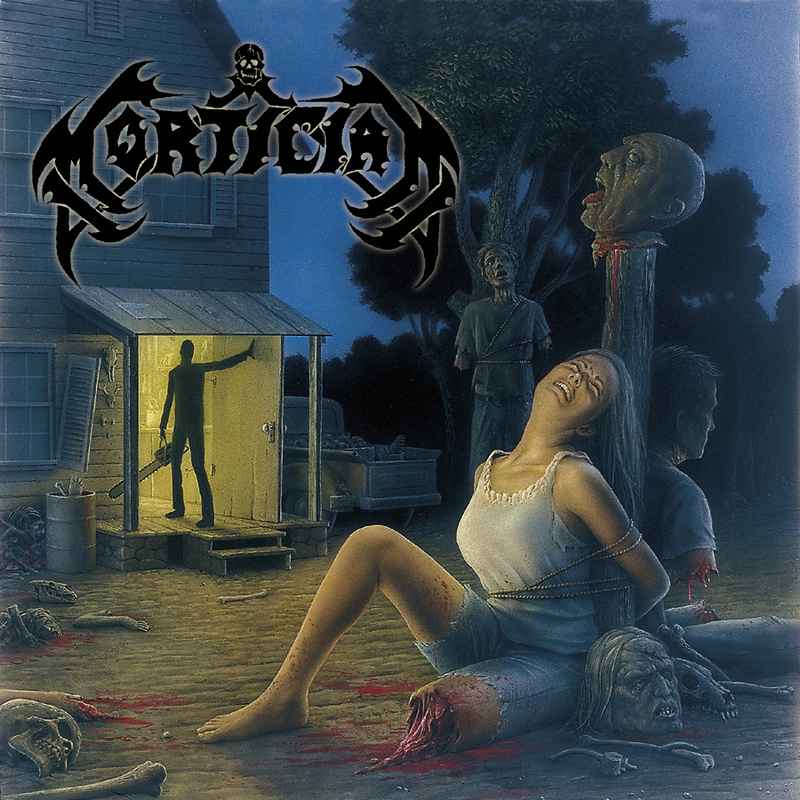 Mortician has never made any claims of diversifying its songwriting approach, and that’s something to be admired (at least on a purely intellectual level). The record lasts nearly 50 minutes, but if it weren’t for the stock movie samples you’d be hardpressed not to think that this was one long song that is occasionally broken up into slower sections to give the listener a breather. That this band never changes can be attributed to the fact that our undynamic duo operates in a highly isolated, self-contained environment for both the songwriting and its recordings. Roger J. Beaujard probably writes and records everything in his own Primitive Recordings Studio, and Will Rahmer will provide bass guitar and lyrics as the songwriting process is well underway. With no intervention from the outside world (be they label execs, PR people, et al) this is guaranteed to function as an echo chamber, thus limiting the duo creatively and stimulating stagnation and regression. Nothing is questioned, thus nothing else is ever requested, and therefore nothing ever changes. This is both a charm and an ultimate negative as by retaining the unwritten status-quo the band forever remain in a creative stasis. Despite its entirely limited creative palette Mortician was able to tour extensively in North America, Asia and Europe for a number of years – until judiciary and personal problems eventually capsized their little venture.